We are fine following this morning's earthquake at 9 am local time. We were about 230 miles away, on the boat, at anchor in a very protected spot. We did not feel anything though our friends on another boat nearby said they felt a shudder. We did receive a tsunami warning about 30 minutes after the earthquake on the marine radio (possible tsunami following 8.0 EQ) and sprang into high alert. We were able to confirm things with contacts in Port Vila with the sat phone. We observed nothing - no big waves or receding of ocean. Three hours later, we received a notice cancelling the alert for Vanuatu. By then we had dug into our reference books and realized that at this distance any tidal wave would have come and gone a long time ago. 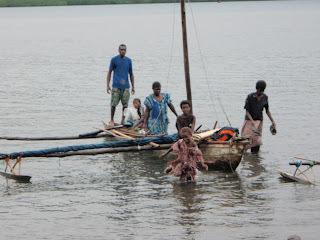 We then took the dinghy to the village about a mile away. All but 6 young men from this 200 person island had evacuated by outrigger canoe a mile across the bay and up a very high hill, having felt the tremors and heard an announcement on the radio that people on low lying islands should move to high ground. So, the emergency warning system does work, I am very happy to report. A bit shocked that this close test came so soon after last week's natural disasters and so close to where we are. We are on the way to Port Vila now at 16.38 S, 167.48 E. We expect to learn more tomorrow but here you have it first hand.